Catfish fools? Since April 1st is widely celebrated as April Fool’s Day I wanted to share a post that, while not a prank, is a bit out of the ordinary: it’s a case of catfishing and catfighting. 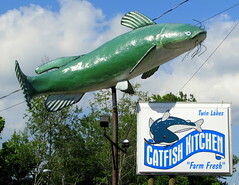 So, get your rod and reel ready and prepare to pull in a catfish! On social media it can be hard to tell who is real… and who has reeled you in. As an example I present the following case of suspected catfishing and catfighting. Can you help solve the mystery? Two people — let’s call them Mark and Nate — met on Twitter and subsequently became Facebook friends. Nate is a writer known for experimenting with social media as a channel for creative fiction. Keep that in mind for now. They met thereafter in person. They had some mutual business together and discussed a potential partnership. Nate also had friend — Molly — who became friendly with Mark through Nate’s Facebook page. Mark and Molly soon became Facebook friends. Absence of Authentication: Molly allegedly worked overseas as a lawyer for the United Nations. However, here was no record of her being a member of the bar in the state from which she claimed to be. There was also no information about her anywhere in association with the United Nations. A Shallow Digital Footprint: Molly has NO digital footprint beyond her Facebook account — despite presumably working in a position of some prominence. Countless Google searches for her name yield no results. Who has no search results on Google? Missed Meeting Opportunities: Molly claimed to have flown back to her home state in the United States, but never contacted Mark during an extended layover while in the city where he lived. She told him of her travels after she had presumably arrived back home. Mysterious Medical Maladies: Molly would occasionally disappear for stretches of time. Usually when she resurfaced, she had some amazing story about almost dying or having some other medical malady. Again, no proof of any kind, just creative storytelling. Odd Area Code: Molly called Mark from an area code in New Jersey — not a number remotely related to her stated overseas location or her home state. Molly explained this as due to her using a prepaid calling card. They did speak on the phone a few times, and her voice was female, but there is no guarantee she was who she claimed to be. Unable to Video Chat: Molly was never available to Skype; there were always technical limitations or issues. She shared some pictures, but they were clearly dated by at least five years; maybe more. Mark and Molly eventually had a falling out and defriended each other on Facebook. Nate later defriended Mark in solidarity with Molly, but never directly discussed the situation with Mark. A year or so later Mark and Nate reconciled and reconnected on Facebook. A short time later Mark and Molly posted replies right after each other in one of Nate’s Facebook threads, randomly “bumping into each other” in the process. Wanting to resolve the past issue, Mark messaged Molly with a conciliatory message. Molly replied positively and they agreed to put the past behind them. Mark and Molly were once again Facebook friends. Mark and Molly began to message each other, catching up in the process. However, Molly had stories about what she had been up to. They all seemed overly dramatic — or at least lacking in some logic and details. Mark overlooked this in an effort to be optimistic. Nate then blocked Mark on Facebook; Mark disconnected from Nate on Twitter and LinkedIn. Mark defriended Molly on Facebook as well. Was Mark being catfished by Molly — and was Nate possibly involved? Should Mark have asked Nate for permission to re-friend Molly? Was Nate justified in his communication to Mark?